What value does the GrabRewards program offer now? 3 Comments on What value does the GrabRewards program offer now? It's more exciting that way. I last wrote about the GrabRewards program back in August last year, when they expanded their ecosystem by adding 150 new merchants across SEA. This included 20 new merchants in Singapore, offering largely underwhelming redemption options. A lot has changed since then, however. Grab introduced a KrisFlyer miles conversion option in October last year and has been steadily growing its Singapore merchants list- thankfully by adding rewards that are actually rewards (i.e. vouchers with no minimum spend) and not disguised marketing coupons. More importantly, Uber’s departure from the SEA market has left Grab as the last man standing. Loyalty programs only really make sense if there’s something to be loyal to. If Grab is the de facto ridesharing option in Singapore, then a loyalty program is just throwing away money. Fortunately, the impending entry of Go-Jek and possible expansion of Ryde (though my experiences with Ryde thusfar have been decidedly mediocre) should keep Grab on their toes, and make them think twice before devaluing the GrabRewards program. What’s more, if the hitherto feckless ComfortDelGro can ride on the sudden groundswell of goodwill it’s acquired by virtue of simply not being Grab, we just might have a competitive market on our hands. What role will GrabRewards play going forward? At its core, GrabRewards works like a rebate program that gives frequent Grab users a certain percentage of their spending back through vouchers with Grab or partner merchants. As someone who follows loyalty programs for a living, I sort of get what he means. He’s talking about the well-documented psychological effect of reinforcement, which is key to a successful rewards program (David Feldman does an absolutely brilliant job of breaking it down here). When customers make a successful redemption, they get a warm and fuzzy feeling of accomplishment, and subsequently are reinforced to work harder towards the next reward. That’s the excitement he alludes to. Unfortunately, most people won’t interpret it that way, and will construe the remark as a ludicrous example of doublespeak. Inelegant phrasing aside, Lim has a point: GrabRewards looks to be an increasingly important tool for Grab to lock users into its ecosystem. Where and how do I earn GrabRewards? GrabRewards now offers you numerous avenues to earn points beyond just rides. 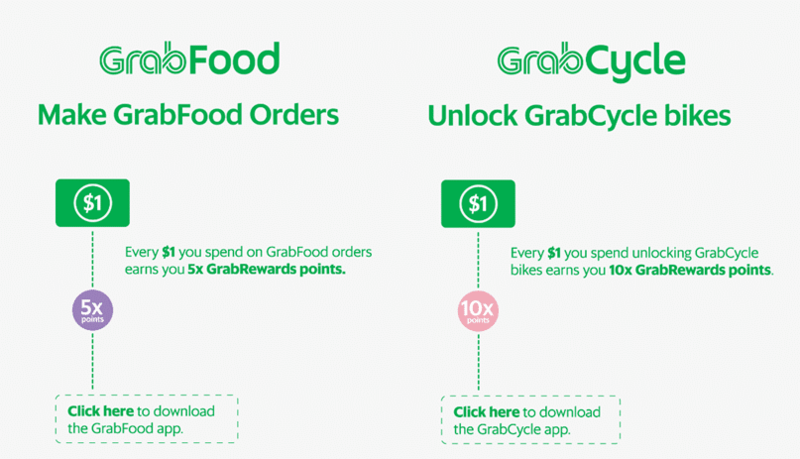 You can earn points when you pay in stores that offer GrabPay, order food through GrabFood (still in beta) or rent a bicycle through GrabCycle. To make sense of those figures, however, we need to understand the value of a GrabRewards point. How has the value of GrabRewards points changed? The last four columns refer to the effective rebate you earn, depending on your rate of earning and redeeming. 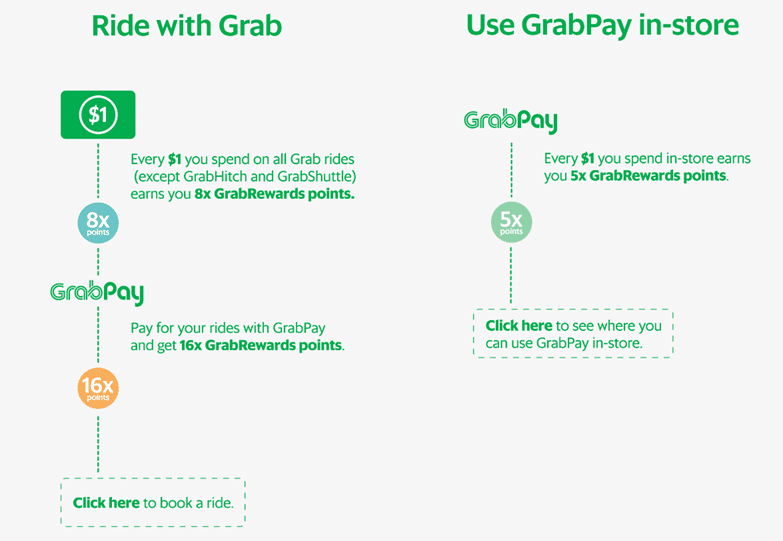 If, for example, you earned purely on Grab rides using Grab Pay (earning 16X every time you did) and redeemed your points purely for Wing Zone $5 vouchers, your effective rebate would be 10%. In reality, people will be earning and redeeming at a mixture of rates, so your blended rebate will be anywhere from 1-4%. As far as rebates programs go, that’s probably the threshold for sustainability. One concern I voiced in my analysis of Uber’s departure from the market was that Grab would invoke a stealth price increase via the devaluation of GrabRewards, but that hasn’t actually happened. Valuation appears to be relatively stable since my last analysis, and given the importance of GrabRewards as a barrier to entry for rival firms, I think that concern has taken a backseat for now. When scrolling through the catalog I also noticed that the conversion rate of GrabRewards points to KrisFlyer miles had been quietly tweaked. 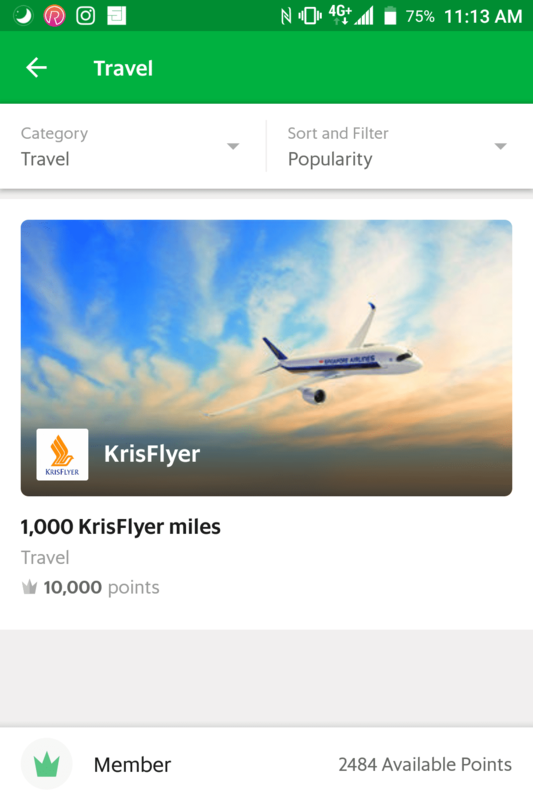 When the conversion first launched, it took 11,000 GrabRewards points to earn 1,000 KrisFlyer miles. Now that rate has been reduced to 10,000 (and I understand that some elite members are seeing prices as low as 9,000). Assuming 10,000 GrabRewards points to 1,000 miles, and an earn rate of 16X, you’d need to spend $625 to accumulate a block of 1,000 miles. In other words, opting to convert your GrabRewards points to miles is like earning an additional 1.6 mpd on Grab rides, assuming you earn at a 16X rate. That’s an increase from the old 1.45 rate, so this is a welcome move in my opinion. I miss Uber as much as the next man, and I think the Grab app still has a long way to go when it comes to UX. And as much as I enjoyed the abundance of promo codes in a Grab-Uber duopoly, I knew that it was never going to be sustainable. All I can say is that GrabRewards has certainly improved its redemption options since the last time I look at it, and that’s a very welcome step. As GrabPay gets more and more widely accepted, there will be additional options to earn 10X everywhere (by topping up GrabPay credits via the DBS WWMC) and that can only be a good thing. Plus, you’ll be able to double dip through the points you earn for paying via GrabPay. Ah well, Lim Kell Jay is now basically Lim Kill Joy. There is an article today published today on Grab.